From May 1. to May 14. the 19th Naviga Section S world championships took place in Hungary. The venue is located at lake Orfü in the south of Hungary near the city of Pecs. The hungarian Association gave the task of organizing such an event to the rc-sailing club “Pecs”. Since I personally have known the location and the main people behind this organization, I had no doubt that this proved to be a good decision. As usual at championships, the event began with 2 days for arrival, registration and measurements. In sailing, each yacht has to have a measurement certificate which states, that the yacht as a whole and especially the sails fulfill the class regulations. At championships this certificates are checked and each and every yacht is again examined and the measurements are checked. In order to do that, the organizer needs a team of experts, who know how to do this. The job of the section leader is to supervise this procedure to ensure that these remeasurement is done correctly. The hungarian team was perfectly up to this task and was, according to what I wittnessed, more then qualified to do the job. The measurement procedure run 2 days in a friendly and professional way. When some minor problems arose, the team was helpfull in eliminating those. At the evening of May 2., the usual team leader meeting was scheduled. The purpose of this meeting is to introduce the team leaders with the race officers and to talk through some of the more important specfic points which in sailing usually are called the „sailing instructions“. Here the race officers, in accompaniment with the main judge, discuss various topics such as additional sailing rules and what they will especially keep an eye on during racing. Also the used scoring system (HMS) was introduced and the inner workings of the system was gone through. Especially at world championships, there is a special „problem“ which usually does not come up at regular regattas, which is the language barrier. Having a large number of different nations as guests, one cannot expect everybody to speak at least english and thus to understand all the announcements during the actual regatta. Therefore it is important, that the teamleaders are instructed beforehand to prepare their team members and to answer all their questions. 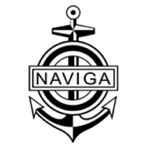 Since a number of years, Naviga switched to a team of 2 race officers for each class and the experiences in doing so are excellent. Of course the hosting organization contributes to that team with supporting stuff which is absolutely necessary, but when it comes to racing it is important, that the officers are able to divide the workload in a flexible way. Knowing each other beforehand helps tremendously to run smooth races from the very beginning. On May 3rd the races in class F5-10 began. 39 competitors began racing for points. Unfortunately the wether conditions had changed. Did we have sunny days and good wind conditions in the last days before the event, the first day of racing was cloudy and rainy and the wind was almost gone. Nevertheless a good number of races could be done throughout the day. The next day the wind condition was still worse. The day was ruled by huge wind shifts. Only in the late afternoon, the wind stabilized into a more or less constant direction and we could sail a few races. The race officers talked to the team leaders and they agreed to postpone the official end time of that day such that 2 additional races could be done bevor a thunderstorm rushed over the venue. But things got worse on the 3rd and last racing day for class F5-10. It was rainy and we managed to sail only one race. After that the wind completely dropped and we were forced to wait for the official time for declaring the F5-10 races to be over. Good thing we did as many races as possible in the preceding 2 days, there were enough races for a sound and valid official result. On May 6th, the hosting organizers put a free day on the time table. They offered to organize a so called „navigational race“ which basically was a race around the whole lake and is done since a number of years. A lot of sailors joined that race while others took the opportunity to explore the neighborhood of the lake and the nearby city of Pecs. I admit, that at first I was a little bit sceptical about what the competitors would say to that day off, but after talking to a lot of them, I changed my mind. Almost all of the sailors, which were already present for nearly a whole week at the lake, were happy to have a day off and to have the opportunity to leave the venue. All who ever participated in a regatta know the situation: you drive large distances to join in some regatta but all you ever see is the race venue. Nearly all participants were glad to have the opportunity to see a little bit more then just the shore or just to relax. Also on May 6th the official opening ceremony was taking place. It was a nice ceremony and after all the speaches were given, the world championship now was officially opened. In sailing, this procedure is always a little bit of a problem, since we are racing 3 classes and not all countries have participants in all classes. Therefor the opening ceremony usually is shifted to a place in the time table, where one can expect most of the participants to be present. The day-off between classes F5-10 and F5-E was a perfect choice for that. On May 7th the races in classes F5-E began. There were 68 boats, which made this class the largest fleet in this championship. But again we had no luck with the weather, it was rainy and very low winds. In contrast, it was very windy on the 2nd day and a lot of races could be done. Same on day 3 of this class and at the end of day 3 we already had the necessary amount of races for a valid championship with one day sailing left. The wind situation changed again on day 4 and in the afternoon the races in class F5-E were declared as beeing finished. Again we achieved a sound and valid overall result. The last 4 days would be racing in class F5-M. But again the wind situation was not that good. 51 participants joined this regatta. In the first 2 days of sailing, the necessary minimum amount of races could be done. Since the race officers feared the weather forecast, which predicted very low winds on saturday and sunday, we asked the team leaders again for their allowence of a changa in the time table. We wanted to do as many races as possible on day 2 of F5-M races and thus started early with racing and postponed the races in the evening. During day 3, we managed to finish heat number 5 and thus we would have a valid result, which was a big relief to the race office. Suprisingly and contrary to the weather forecast, we had good wind on the last day of racing. Until afternoon it was possible to finish 10 heats, which was important because then a second discard would become active. (In Naviga, we do have one additional discard every 5 heats). Sunday afternoon also saw great winners and worthy champions. So what is my summary of this championship. All in all, it was a good one. Although the race officers sometimes had to refer to video to figure out what has really be going on the water, it was fair sailing during most of the time. Also there were very little protests and requests for redress, which is always a good sign. The system of 2 race officers had again worked well and ensured, that nearly all incidents could be announced and decided immediately during racing without having to refer to the video recording, which is always a time consuming task. The hosting club did its best to ensure proper environment for everybody and this worked out very well. Having a big space, such that everybody could protect themself and the electronics from rain is an absolute must. Also there was enough space and more then enough tables, such that necessary repairs could be done in an orderly fashion. The organizing team was well prepared, everybody knew what to do and was qualified for the job. A big „thank you“ to all of the people involved and working behind the curtain – you did an amazing job. Also the organizer did its best to come up with some surrounding program and entertainment, which was gladly accepted by the participants. Once again: A big thank you to the organizers of this championship – it was a wonderfull experience for everybody. We all left as we came – as friends – and are looking forward to the next championship, wherever that may be.